I am so excited to read this book. I adore this series so much. Actually, I love everything that Roseanna writes because she is an AMAZING storyteller. 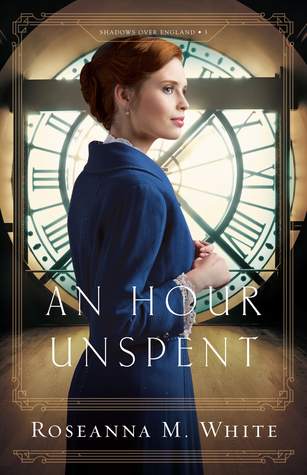 An Hour Unspent is next up on my review schedule, and I cannot get to the book fast enough. 🙂 Definitely check back soon for my review of this novel. I am sure the book is excellent. Hope you have a great weekend filled with fabulous reading time!!! “Where are the lamb?” Ernestine asked when she and I caught up to the rest of the group at the pasture fence. I’m sharing about “A Lady of a Thousand Treasures” by Sandra Byrd over at my blog, but I’m almost finished reading, “The Bullying Breakthrough” by Jonathan McKee. So my first line will come from there. It’s 6:37 a.m., and I haven’t slept for hours. This has been an emotional project for me, probably the toughest I’ve ever tackled. Not because the research has been any more burdensome or the topic more daunting, but because never have I heard so much anguish and hurt. Loved this and ALL of Roseanna’s books! It was an awesome read I think you’ll enjoy it! This week on my blog I’m featuring Everything She Didn’t Say by Jane Kirkpatrick but it’s also the book I’m currently reading so I’ll share the first line from my current chapter (13) here: “Doing what I haven’t ever done before has become a kind of purpose for me.” Hope you have a great weekend with plenty of quality reading time! I love the cover of this book. Great intro! Thank you for sharing, Michelle. Sounds like it will be an interesting book. Happy reading! It stopped me and I had to read it twice, so I knew it was the one to share! I know you’re going to enjoy An Hour Unspent! I’m guessing this is that Southern meaning of “bless her heart” which means anything but!